Cats are pretty smart. They did, after all, convince an entire ancient civilization to worship them. So when we look at the pictures below, it's safe to assume that these cats aren't just being stupid. No. These cats are making a statement, and that statement is: "We don't like your gifts. And even if we do, we're not going to let you know it." Do you have a cat that doesn't appreciate your gifts? Don't worry, they probably didn't appreciate the pyramids either. Still, feel free to share your pictures and don't forget to vote for your favorite! I really like this. Fancy cat toy? No, choose the cheap box. And that look which says: "So what?" Jungle cat watches prey from treetop. Shade from the sun. Thinking about it, I would do the exact same. That's right. Just don't even think about it . . .
Maybe he's just waiting for you to take it out of the box? Boxes and bags will always win. And some kitties take time to adjust. Lose the box so it doesn't draw kitty's attention away and in time she will love the tree! The other poster only paid $30 for theirs. #21 Box Says "keeps Kitty Entertained For Hours". Well They Weren't Wrong. #23 Bought Cat Toys, But The Plastic Bag Is More Interesting. #24 You're Doing It Wrong, Cat. He looks sick :( ...hasn't given his fur a lick anytime soon and nose looks iffy...you sure he/she's alright? The box is bigger! Way better cave. is it free range, organic, gmo free? I know someone who bought the exact toy, and the cat wasn't too bothered. Stan Marston click on the report button. I'm pretty sure they'll take it down. she's beautiful. what breed is it? #33 And That Pretty Much Sums It Up. Punks. #35 Kitty Condo Gone Wrong. every time i buy something in a box, i tell the cats i bought them a present. #39 What Bed? Toys?nope, Books! 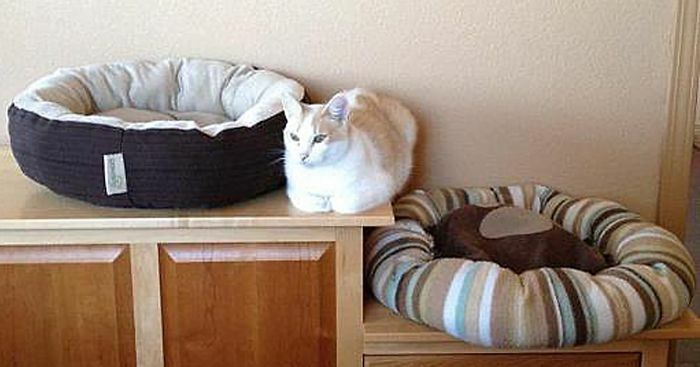 #45 3 Cat-beds Later, "it's Too Hot Inside The House"
It seems like peaceful picture until a drop of water exist!!! #49 Bought Something Nice For The Cat, Choose The Box, Stay Away Dog, Box Is Mine! Miiiine!!! #50 You Are Not Going On Holiday Without Me! #51 This Is For Me... No? "....but it's better with me in it." #55 Still Trying To Fit! #57 My House, My Washing Cat-chine! #58 Only An Orange Bag Will Do! #59 4 Cat Trees And 6 Cat Beds In The House. And One Far Superior Bathroom Sink. #60 Can I Come On Holiday Too? #61 Ryan, Ramjet And Roger Playing A Crazy Game Of Cat Tetris!! #63 Who Needs A Bed When I Fit Perfectly In This Bag. #66 Take Off Your Pants And Pass Out On The Bed. #67 But This Is My Bed! This is the most adorable pic i have seen!!!! #72 My Cats Like Their Gifts. #1 Is At Shirt A Box And A Blankit. #73 Near Enough Is Good Enough Right?!?! #74 She Never Uses The Pillow. #83 Don't Bother Unpacking - It's Mine! #84 In The Greenhouse !